Keeping your ducts clean and clear is more important than you know. Airborne pathogens are some of the biggest causes of sickness in children and adults, and they come from bacteria, dirt, and grime within the ventilation system within the home. Why place your family and yourself at risk? 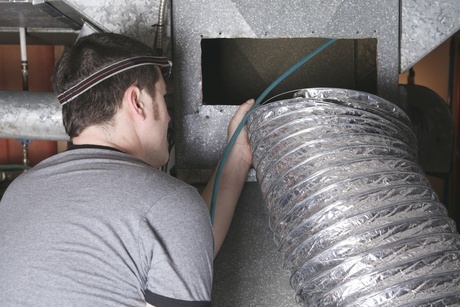 Get the best duct cleaning services in Columbus, IN and make the call to Timberline Restoration! Timberline Restoration has been perfecting our duct cleaning methods since 1997. In all the time, we have built the experience necessary to do the most thorough assessments and service fulfillments in the industry, while still offering friendly, understanding customer service with each and every job. Our certified techs know the inner workings of all kinds of HVAC systems, and use the highest-quality, hospital-grade disinfectant to ensure all types of filth are removed from your systems for good. Q. Are your chemicals safe? A. Yes, we use all biodegradable chemicals. Q. I have moved into a house with a cigarette smell, can you get that smell out? A. Yes, we recommend letting us clean the duct work and possibly even doing a thermal fog in the residence. Q. Can you get curry smell out? Q. Can you get rid of burnt chicken smell?